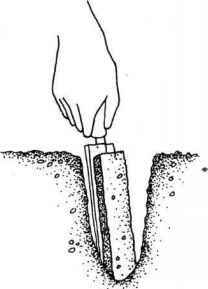 Use a trowel to take a soil sample half an inch thick and eight inches down. that do the tests. Either way, you will be charged a fee for the test. The results of the soil test will give you the pH (acid-alkaline balance) of the soil and its content of three essential nutrients: nitrogen (N), which promotes leafy growth (although too much nitrogen will encourage too much foliage growth and slow down crop ripening); phosphorus (P), which is important for root growth and the production of flowers, fruits, and seeds; and potassium (K), which is necessary for the development of leaves and roots. The pH is measured on a scale of 1 (most acid or sour) to 14 (most alkaline or sweet), with 7 representing neutral. Most vegetables do best in soil that has a pH between 5.5 and 7.5, and most of them prefer soil to be on the acid side of neutral. How to take a soil sample. Soil samples can be taken any time of the year, as long as the ground isn't frozen hard. Use a plastic bucket instead of metal, especially if the soil sample is to be used for testing micronutrients. You'll also need a digging tool, such as a spade or a trowel, and a clean container (a carefully washed-out one-pint milk carton or the container provided by the testing service). All equipment should be perfectly clean. If there's any grass on the spot you're sampling, remove it. Then take a slice of soil half an inch thick and about eight inches deep straight down from a number of locations throughout your garden. If you're sampling a large area, 20 samples mixed together will do as fine a job as 40 or100. if your garden is small, a minimum of five samples will be enough. Place all the samples in the plastic bucket, and then mix them thoroughly. If the soil is very wet, let it air-dry before mixing. Do not heat it in the oven or on a radiator; heat will kill the microorganisms and cause nitrogen and other elements to change form, making the test inaccurate. If there are a lot of lumps, crush them with a wooden spoon or a rolling pin on a wooden surface. After the soil is thoroughly mixed, fill your container and follow the laboratory's instructions for sending the sample. centers; the laboratory report will tell you how much to use and how to apply it. It's a good idea to have your soil tested every three to four years to make sure that the pH is in an acceptable range. If you've had a problem with the pH, it may be a good idea to test your soil even more often. This may seem like a lot of work, but good soil is essential to a good harvest, and your care and labor will pay off in higher yields and better-quality vegetables. Many inexperienced gardeners have the idea that since their vegetables have been doing fine so far without fertilizer, they'll do fine without it next year, too. But it's not quite that easy. Certainly, your plants may provide you with vegetables even if you don't fertilize at all, but you won't be getting their best effort. Vegetable plants that are properly fertilized will be healthier and better able to resist disease and attacks from pests, thus giving you more — and higher-quality — produce. Organic matter has to take nitrogen from the soil in order to keep the decaying process going. Composting keeps the waste in one place where it's not depriving plants of nitrogen. Composting can save money that you would otherwise spend on soil conditioners and fertilizers. It can save time, too, because it gives you a place to dispose of leaves and grass clippings. Compost forms as organic wastes are broken down by microorganisms in the soil. These microorganisms don't create nutrients; they just break down complex materials into simple ones that the plant can use. Most soil organisms are inactive when soil temperatures are below 40°F; they don't begin working in earnest until the temperature goes up to about 60°F, and most of them don't work well in a very acid element. 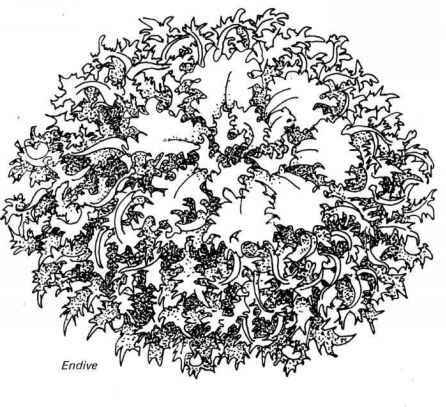 Because they are extremely small, microorganisms work faster when not overwhelmed by large chunks of material. There are two basic kinds of microorganisms: those that need air to work (aerobic) and those that don't (anaerobic). It's possible to compost in an airtight container, thanks to the microorganisms that don't need air. A tightly covered plastic trash can will convert an enormous amount of organic kitchen waste into compost in the course of a winter. The classic outdoor compost pile should be turned regularly with a pitchfork to provide air for the microorganisms that need it. A low wall of cinder blocks keeps the compost pile neat. Small-space gardeners can compost in a plastic garbage bag. If space is at a premium or if a compost pile doesn't fit in with your landscaping, start the heap behind some bushes or behind the garage. 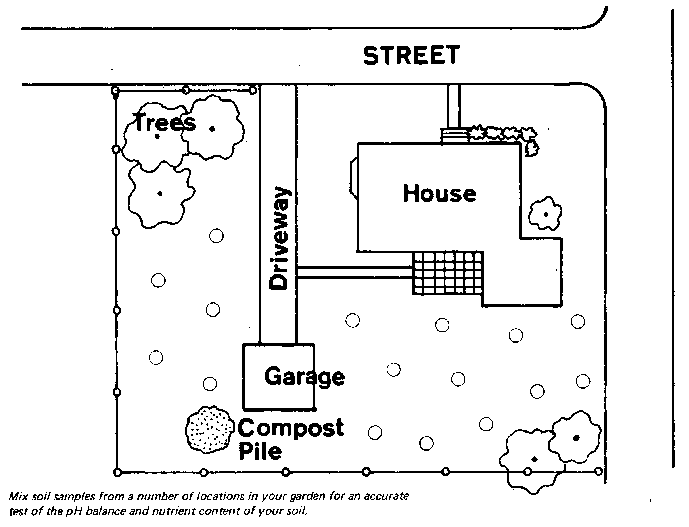 If the space available is extremely small, you can compost in a large heavy-duty plastic bag or plastic garbage can. You can also work the material directly into the soil. To build a compost pile, start out with one to two feet of leaves, if you have them, or six to twelve inches of more compact material, such as grass clippings or sawdust. 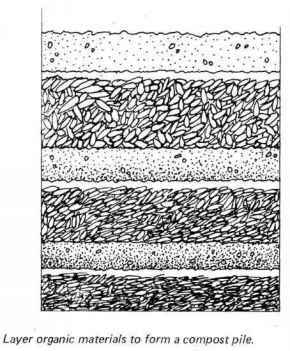 Over this put a layer of fertilizer (manure, blood, bone, cottonseed meal, or commercial fertilizer) and some finely ground limestone (most microorganisms like their environment sweet). Then add some soil to hold water and provide a starter colony of microorganisms. Water the compost carefully. Add a second layer of leaves or other garden waste and repeat the layers. If you have enough material or enough room, put on a third layer. The pile should be kept moist like a squeezed, but not sopping, sponge. As more material becomes available, make new layers, adding more fertilizer and lime each time. Turn the pile with a pitchfork about once a month. You can use all garden waste on your compost pile except disease- and pest-laden materials, or those that have been treated with pesticides or weedkillers— for instance, grass clippings from an area that's been treated with a herbicide. Use nontreated grass clippings, leaves, weeds, and sod. You can also use kitchen leftovers like vegetable and fruit peels, vegetable tops, coffee grounds, tea leaves, and eggshells. The finer these materials are chopped and the deeper they're buried, the quicker they'll be converted and the less chance there is that they'll be dug up by inquisitive animals. You can also compost hay, straw, hulls, nutshells, and tree trimmings (not walnut). But unless they're shedded, these materials will take a long time to decompose. There are a number of ways you can speed up the composting process. First, you can grind or shred all. compost materials to give the microorganisms a head start. Second, make sure the pile doesn't dry out, and provide enough fertilizer to encourage rapid growth of the bacteria. Third, you can use a starter culture, either material from an established compost pile or a commercial starter culture. 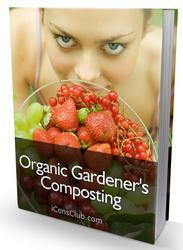 Composting is a creative activity. There are almost as many different methods of composting as there are gardeners, and like a good stew, the proof is in the final product. And when other gardeners see your compost pile, they'll know you're taking good care of your garden and that you're not just a horticultural dabbler.